Wi-Fi thermostat installation in Yorktown is often done by experts, but it’s very easy to install the latest models of wireless thermostats if you have some basic knowledge of electrical circuits. When you’re ready to install your wifi thermostat, the process outlined here will guide you through the installation process of most popular types of thermostats on the market right now. 1. Switch off power at the breaker of system switch to protect yourself and avoid blowing a fuse in your equipment. 2. Remove the cover from the old thermostat. 3. Check your system if you haven’t already confirmed that your wires are compatible with your chosen brand of wifi thermostat. 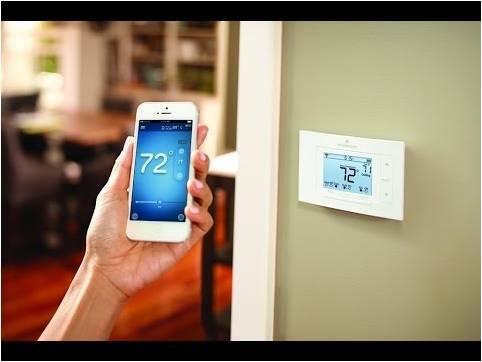 If your system is high voltage, it may not be compatible with the type of wifi thermostat. All high voltage systems will be labeled 110V, 120V or 240V, or it will have thick wires with wire nuts. 4. Remove jumper wires, which are the short wires between two connectors. Many wifi thermostats do not require these—check the instructions before removing any jumper wires. 5. Label the wires with the labels included in the thermostat system’s installation guide. 8. Attach the new base by pulling the wires through the center of the base, then attach it to the wall with the screws. 9. Connect the wires and then push them down to make them flush with the base. Hold the connector’s button down when inserting a wire and let go after the wire is fully inserted. You’ll know a wire is properly inserted when its terminal button stays down after you let go. Some wires may need straightening before they will insert completely. • Take the backup battery out of your old thermostat so that when the power is turned off the thermostat will shut down completely as well. To make sure that it worked, adjust the temperature and check that the HVAC system doesn’t start up. • Never try to connect a thermostat to a high voltage system if it is not built for it. Always read the instructions for warnings about high voltage use. • Take a photo with your phone of the wires on your old thermostat so you have a future reference. • After removing the base from the wall, wrap your loose wires around a pen or pencil to ensure they don’t fall back into the hole in the wall. It’s a little trick from the pros! • Power to the HVAC system must be off during the entire installation process (excluding the testing step) to avoid blowing a fuse. • Attach the new base to hard wood easily by drilling with a 3/32 or 2.5mm drill bit. Our 11 step process for wifi thermostat installation in Yorktown is a very general description of the current process used to install most wifi units. It should not be used in lieu of the manufacturer’s instructions.